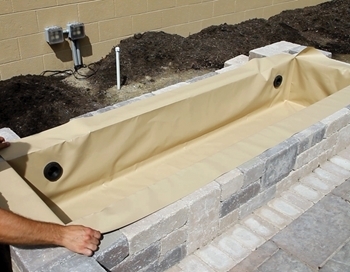 Pond Supplies, Pond Liner & Water Garden Supplies - Atlantic Flexible Hardscape Basins 48"
Prefer an open basin for your Scupper or Spouts? Our Flexible Basins are the perfect choice for custom block reservoirs up to 8 feet wide, especially in northern climates, where frostproofing masonry can be a concern. Available in tan and grey to match or complement block colors, these rip stop PVC reservoirs eliminate corner folds and wrinkles of makeshift EPDM constructs and come pre-punched for included bulkhead fittings, with 10" backing plates for plumbing submersible or external pumps.